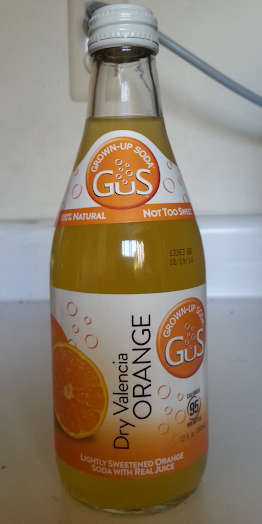 Much of what I said about the GuS Star Ruby Grapefruit in Jerking Around #3 applies to the Dry Valencia Orange as well – it’s not too sweet, has sediment in the bottle requiring gentle agitation, and is quite refreshing. It’s even almost as tart as the Star Ruby Grapefruit; the difference can be attributed to grapefruit juice being somewhat more tart than orange juice, and the Dry Valencia Orange doesn’t have any grapefruit juice. While I don’t have anything negative to say about the flavor, I probably won’t be a regular purchaser of this – I can do just as well, in my opinion, by mixing a good brand of orange juice with seltzer. And doing so will probably be cheaper in the long run. I find this at one of the food vendors in the Grand Central Terminal dining court, and also at a nearby Fairway supermarket.